"... the Environmental Risk Management Authority (Erma) has signalled that genetic experiments will no longer get an easy ride to approval"
"One of New Zealand's biggest food companies, Goodman Fielder, has taken a stand against genetic engineering"
"New Zealand should be looking at other ways to control weeds rather than by producing herbicide tolerant onions, growers say"
"... It's as if all the clean, green marketing, the image New Zealand has worked so hard to cultivate around the world, is no more than a thin veil of lies"
"An investigation has started into possible contamination of genetically modified pine trees being grown in a field trial"
"The state-owned Crop & Food research institute has unveiled the mystery collaborator on its genetically modified onions project"
"The moratorium on commercial release of genetically modified organisms ends at midnight tonight with the biotechnology industry hailing it a milestone and opponents threatening sabotage"
"Subway sandwiches made in New Zealand use the same bread dough that has caused an outcry in Japan because it contains a product made using an unauthorised GM organism"
"On the eve of the lifting of the GE moratorium, science reporter Simon Collins finds the jury still out on safety"
"A Te Arawa elder has endorsed research aimed at producing a genetically modified pine tree - but Auckland's Ngati Whatua people are not so sure." "The Prime Minister, Helen Clark, consistently characterises her refusal to extend the moratorium on applications for the release of genetically modified organisms into the environment as 'rational'"
"Some 9000 protesters marched through the centre of Auckland today to show the Government the groundswell of opinion against genetic engineering"
GM: Is it too soon? "New Zealand opinion has swung heavily against releasing genetically modified organisms into the environment"
"The Government today played down a discovery of imported maize seed contaminated with genetically engineered (GE) material..."
The first application since the moratorium on the commercial release of genetically modified organisms was lifted on 29 October 2003, has been approved by the Environmental Risk Management Authority (ERMA). Field testing by state-owned Crop and Food Research, was approved with controls, on December 22, for genetically modified onions in containment at a site near Lincoln University in Canterbury. The genetically modified onion is tolerant to glyphosphate, an active ingredient in the Monsanto weedkiller Roundup. ERMA approved Crop and Food's application despite a flood of 1924 submissions opposing the test. Only eight submissions were in support. The agency has never turned down a GM application. The New Zealand government has ignored public opposition to GM, in its determined course to stay competitive in world markets, and to take what it believes to be the only economic path. Two months before the moratorium was lifted, a nationwide Herald-DigiPol survey showed that 68% of New Zealander's want the ban on releasing GMOs to continue. In pursuing GM, the government is turning its back on the established "clean and green" New Zealand brand. Research commissioned by the Ministry for the Environment at Lincoln University reached the conclusion that GM release would significantly depreciate the brand. Evidence showed that 25% to 37% of consumers in the United States, Britain and Australia will be less likely to purchase New Zealand food products, even if they were GM-free. About half of these consumers are more likely to buy New Zealand food if GM organisms are not released into the environment. In a world divided on GM, market definition for GM food products remains on shakey ground. A rational argument has not been presented to justify abandoning the known "clean green" market, for a fuzzy GM market simply for reasons of greater yield and less production cost of GM products. The GM issue is creating a greater worldwide consumer awareness of food ingredients. New Zealand is already very well positioned with its clean image, with an opportunity to capture a growing demand for healthy food. 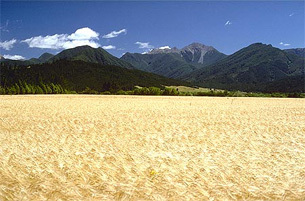 Opposition to GM in New Zealand is mainly for reasons of uncertainty of the effect modified food might have on human health, and impact on the country's historic natural resources. It is now accepted that horizontal gene transfer (HGT) occurs more frequently than first realised. This science is in its early stages, and not enough is known to fully understand the potential impact of GM organisms. If a gene that provides resistance to a herbicide is transferred to an environmental weed, a 'super weed' that is resistant to the herbicide could be produced. A gene that provides faster or larger growth could also be transferred to existing weeds. The forestry industry is developing sterile pine trees that produce no seed, and trees without lignin (the element removed to make paper). It is alarming to think of the genes that produce these characteristics being transferred to native trees such as totara, kahikatea or kauri. The New Zealand environment has demonstrated an extreme vulnerability, with its optimum growing conditions for introduced organisms that get out of control. In less time than anywhere else on earth, 20,000 plants have been introduced into the country, so there are now more exotic species growing in the wild than native species. Natural hybridisation by pollen or bacterial transfer is occurring at a rapid rate. The risk of devastation of natural ecosystems from super weeds worse than long time pests such as gorse and blackberry, and more recent problem plants like old man's beard or morning glory that cover large forest trees, exceeds any GM production or pest resistence advantage. Government is acutely aware of the susceptability of the country's ecology, and is prepared to invest in mitigation and research to protect it, except when it comes to introducing GM organisms. The Royal Commission recommended an emphasis on research on environmental vulnerability, instead of the health impacts of GM. But while little has yet been accomplished in establishing standards, ERMA is proceeding to make decisions on GM release. Science has not established the most critical standard, the distance of crop separation. Opinions vary on the distance bees travel to gather pollen. The seed certification industry has used distances ranging from 100 metres to 3 kilometres, but bees are known to travel much more than 5 kilometres for pollen. Biotechnology research is funded with $120 million a year, which includes $20 million for development of GM organisms. Government funded study of the possible impact of GM on the environment, economy and cultures is a paltry $6.6 million. In comparison, the Ministry of Agriculture and Forestry is spending $90 million over three years to eradicate the painted apple moth in West Auckland. Meanwhile, as the government turns a blind eye to the horror stories of financial ruin of non-GM farmers caused by GM pollination in the United States, and British research showing GM damage, ERMA forges blindly ahead promoting the idea of "managing genetic modification in New Zealand", and "making it work". Meanwhile, debate and opposition will continue. ..... before it is realised that scientific knowledge of the environmental impact of nonindigenous plants and animals is essential, prior to introducing them? When rabbits, deer, goats, pigs and possum were introduced into New Zealand's 'edge ecology' in the 19th century, nobody had a clue about the pestilence that would occur. When stoats were introduced to control rabbits, it was not foreseen that they would flourish, to become the most harmful predator of the world's greatest collection of flightless birds. Again today, the introduction of foreign GM organisms is being allowed, in ignorance of their impact on natural ecosystems. New Zealand's food retailers would do well to follow the example of the British retail chain Co-Op, which found from a survey that 80% of its customers would not purchase food containing genetically modified ingredients. Co-Op has banned GM products throughout its entire business. The two retail food suppliers that control all New Zealand supermarkets could decide to be GM free, if a majority of customers refuse to shop in stores carrying GM products. Progressive Enterprises Limited, which is owned by one of Australia's largest public companies Foodlands Associated Ltd, operate Woolworths, Price Chopper, Foodtown, Countdown, FreshChoice and SuperValue supermarkets. Foodstuffs is New Zealand's largest grocery distributor, and the country's third largest business. It controls all Pak'N Save, New World, Four Square and Write Price stores. Foodstuffs announced on November 6 2003 that its Pam's food brand will go GE-free. "Many so-called organic foods contain genetically modified soya." "The Government asked us to heed the science on genetic modification. Will it now take its own advice?" "British scientists have delivered a massive blow to the case for genetically engineered crops by showing in a trail-blazing study that growing them could harm the environment." "Monsanto, the world's largest genetically modified seed company, is to close its European cereal business headquarters." "A mysterious farmer at a secret location somewhere in northeastern Colorado is expected to plant a corn crop that must never be eaten by humans or animals, must never come in contact with other crops, and is so volatile, a 1-mile buffer must surround it to prevent pollen from contaminating other crops." "More than half of Britons who took part in a nationwide debate on genetically modified crops said they should never be introduced under any circumstances." "Laws which will end a European Union-wide ban on new genetically modified foods have been passed by the European Parliament. The laws allow new GM foods to be sold in Europe for the first time in five years, but only if they are clearly labelled." "US President George Bush has accused Europe of blocking efforts to fight famine in Africa because of "unfounded" fears over genetically modified foods." "Biopharm firm faces USDA, FDA actions over corn contamination." "Amid the efforts to cope with a famine threatening 30 million Africans, a row is raging over genetically modified (GM) food aid." As Jack Heinemann, the director of Gene Ecology at Canterbury University points out with regard to bacterial transfer, there are two billion bacteria in a gram of soil. If one in 100 million pick up a genetic element from a plant, it would be necessary to examine genetic structures of hundreds of millions of bacteria to locate it. Dr Heinemann's reminder of four separate changes to the proteins in streptococcus pneumonia bacteria during the last 50 years, which made it resistant to penicillin, provides a strong incentive to avoid messing with nature, and to consider human health. Isolated studies that show no GM damage to a few species, such as the HortResearch life-span studies on bees and leaf caterpillars, will be insufficient support for a GM green light. There are still thousands of species out there. On the other hand, proven damage in isolated cases should raise scepticism about unknown impact, and cause opposition to grow.